Overview: Panasonic KX-TES824 Advanced Hybrid PBX System can cost effectively support all your personal and business communication needs. The system supports 3 outside (CO) lines and 8 extensions – all built-in so you can use the system straight out of the box. With optional cards, you can easily expand the capacity up to 8 outside (CO) lines and 24 extensions as your needs grow. The system provides features that can satisfy the demands of the most sophisticated and cost conscious users. You can even connect a variety of communication devices, such as cordless phones, answering machines, computer modems, credit card verifiers, fax machines, and any other device that works with conventional telephone lines. Packed with so many features – the Panasonic KX-TES824 EPABX is ideal for a small business or home office requiring a flexible system with a high degree of sophistication. Your telephone system is an integral part of your establishment and your primary link to your business partners, customers, suppliers, employees, colleagues, friends and even your family members. The affordable Panasonic KX TES824 advanced hybrid PBX system can support all your personal and business communication needs. The compactly designed PBX system supports 3 outside CO lines and 8 extensions so that you can use the system straight out of the box. With the optional cards, you can easily expand the capacity up to 8 outside CO lines and 24 extensions as per your needs. You can also connect to a variety of communication devices such as cordless phones, answering machines, computer modems, fax machines, credit card verifiers and any other device that works with the conventional telephone lines. This KX TES824 is ideal for small business or home office requiring a flexible system with a high degree of sophistication. Panasonic KX TES824 PBX supports a Direct Inward System Access (DISA) function that lets outside callers to access any extension without going through an operator. Automatic greeting messages can be recorded, directing the caller to an appropriate destination. You can customize the system to allow SMS message senders to address their messages directly to a specific SLT (Single Line Telephone), assuring that the desired user receives their messages quickly and privately. You can enjoy the efficiency of using voice messaging without adding a separate voice mail system. You can customize your voice mailbox by recording your own greetings which will be played when you cannot answer your phone. The system is compatible with caller ID service which allows the user to see the caller’s information before they answer the call. The PBX system offers unprecedented flexibility and simple expansion, efficient call handling, economical cost management, easy programming and easy maintenance. 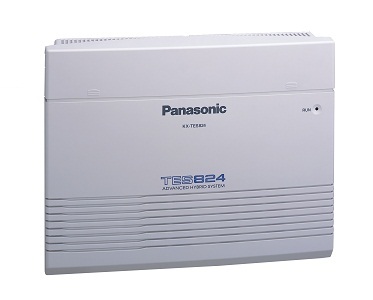 The Panasonic KX TES824 PBX comes with safety features to ensure safety of your confidential information.